Independent Watkins Consultant Coleen Sykora (#362289) proudly presents the respected home business with Watkins. Oh, yeah! 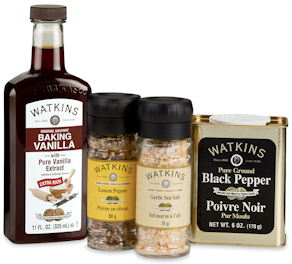 You and your customers will love Watkins products. After all, Watkins doesn't just dabble at making top-quality, natural-based products... they've been doing it with passion for 150 years! 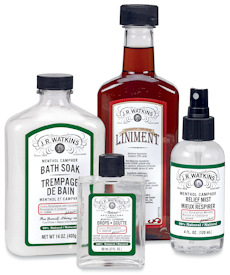 Watkins was truly North America's first health and wellness company. And, Watkins was the first company of any kind to offer a money-back guarantee on their products! Now that's something worth shouting from the rooftops! Using Watkins gourmet ingredients in your meals lets you give your family a better standard of living without breaking the bank. The value and taste help you eat at home more often, for a healthier, happier, less-expensive lifestyle. 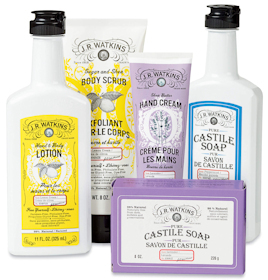 You'll be energized and looking your best with Watkins personal care line. Treat yourself right with the finest quality products for total body care that nourish and protect your skin. Watkins has innovative products to soothe and relieve discomforts, and products that reflect new scientific research on health maintenance. You can trust Watkins to make your family feel better and keep them in great shape. Watkins keeps things fresh and clean, but avoids undesirable ingredients that could hurt your family. These products have superb cleaning power and are never tested on animals. The statements made and opinions expressed on this site are those of Independent Watkins Consultants who are recognized by the Watkins Company as official training and support leaders for the Watkins Home-Based Business opportunity, who have published this website as a free business-building tool for our team member Coleen Sykora (Independent Watkins Consultant #362289). The statements made and opinions expressed on this site are from these field leaders and have not been specifically reviewed by the Watkins Company. Testimonials are based on personal experiences, and we cannot guarantee these same results for everyone.